Our BlackBerry Q10 came with just the essential accessories - an A/C Adapter, a USB cable, and an in-ear headset with some oddly-shaped earbuds of varying size. While the Z10 was intentionally a decisive departure from the designs of old, the BlackBerry Q10 is clearly the product of a company that values tradition. Being the successor of the BlackBerry Bold Touch 9900, the Q10 has nearly the same footprint at 119.6 x 66.8 x 10.4 mm and weighs just 9g more - the perfectly manageable yet reassuringly solid 139 grams. It is an instantly recognizable BlackBerry handset and this has nothing to do with the fact that there's virtually no meaningful competition in the QWERTY messenger class. Getting rid of the trackpad and hardware call keys must've been a move radical enough, leaving no room for further experiments with the design. There're just improvements fans will mostly approve of. 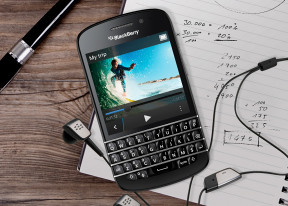 The Bold Touch 9900 was the first BlackBerry to sport a touchscreen above the full QWERTY keyboard. That one had use for the trackpad but the completely redesigned OS does well without it. By the way, the full keyboard is put to good use with a number of useful shortcuts that should be familiar to experienced BlackBerry users. Actually, a big part of the BBS OS 10.1, which comes stock on the Q10 was about making it compatible with keyboard input - that and the addition of Instant Actions to the universal search. Anyway, there are other design choices than the missing trackpad that set the BlackBerry Q10 apart from its predecessors. The metal frame running all around the chassis is gone - that's one accent less for an understated but altogether more compelling look. Overall, the Q10 is betting on cleaner lines and more simplified styling. The QWERTY keyboard now has perfectly straight lines. The back panel is a single piece of some sort of composite material, developed by BlackBerry engineers. It has an extra pleasant rubbery finish, as opposed to a similarly looking carbon fibre inset in the Bold Touch 9900, which was at odds with the surrounding material. The phone's back is nicely curved for comfortable handling. The finish is as good as immune against fingerprints and provides for a great, secure grip. It is an excellently built device and the overall feel is one of conservative comfort rather than intrusive luxury.